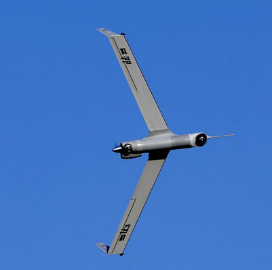 Boeing‘s subsidiary Insitu will start to perform testing and development work on the propulsion system for the ScanEagle unmanned aerial vehicle following Orbital Corp.‘s delivery of the first engine. Orbital said Tuesday that the internal-combustion engine was built specifically for small unmanned aircraft systems such as the ScanEagle. Terry Stinson, chief executive and managing director of Orbital, said the company will now move on to the next part of the propulsion engineering project. Orbital leveraged its Argon Engine Control Unit technology to provide tools for real-time systems monitoring and diagnostics and “black box” recording, FlexDI for fuel management as well as vibration and noise suppression functions, Orbital said. The company has worked with Insitu since January 2013 to design, develop and evaluate UAV propulsion systems.